Very historically acurate and a well told love story for younger people. Release planned for Tuesday, September 17, 2002 at DSI Mail Room in Novi, Michigan USA. I'm sending this book to some one in Tennesse who asked me for it. In return I'm getting a book from her bookshelf. I'm anxious to see how this swaping experiment turns out. Book arrived today from LaFargette...will be reading soon! =) Thanks! Released on Monday, November 10, 2003 at Starbucks (across from McKay's) in Knoxville, Tennessee USA. Great book! I hope it finds the perfect reader. I left this on an end table near the comfy chairs! Caught this book at the Starbucks on Kingston Pike in Knoxville, TN across from EdMckay's Used Books & More. I read it in the car on the way home to Charleston and I liked it quite a bit. Not generally the type of book I read, but certainly well done for this kind of literature. A sweet bit of historical love story perfect for a light read on a rainy weekend day. I decided actually to take this book on my journey to Europe next month and release it into the wild there! Released on Thursday, May 06, 2004 at The Booklet at Berenstraat 22 in Amsterdam, Noord-Holland Netherlands. My partner rolled me down tilted cobblestone streets for two hours to eventually find this lovely used book store & official BookCrossing zone in Amsterdam. The coffee (as in java) was great, the manager was fabulous and the books were outstanding. Here I released this book as well as several others I took over there from the states. And Fong, the lovely manager, must have taken this one along with her to our bookcrossing meet-up at the beach today, where it jumped up from the table and settled smugly in my hands. Well, this couldn't have come along at a better moment for me. Another book, 'Ishmael' by Daniel Quinn, got me thinking a lot about tribal life versus modern society. I am very curious. I suppose Ann Rinaldi did a lot of research, she is so detailed in her descriptions of everyday life for the pioneers in America. It was thrilling for me to read about the thoughts of a girl growing up in an environment which represents the clash of western culture and pristine nature, inhabited by Native Americans. It is clear who's side the author is on in this clash. A detail: the settlers use the word 'improvement' when they mean clearcutting of forest, driving off or killing the people and the animals that live there, and start farming. Ann Rinaldi puts the word between quotation marks. 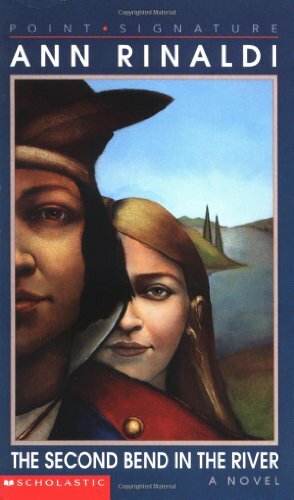 Still, you would think that in the end, the girl who is in love with the beautiful, noble, peace-loving Tecumseh would not settle for petty indoor life instead of choosing for the guy she has been longing for throughout the better part of this book. I will cross it again at our next meet-up, August 1. Release planned for Sunday, August 01, 2004 at Jane Goodall Instituut in Deventer, Overijssel Netherlands. Tijdens de meetup of de BBQ. Found this book on the stairs of the Jane Goodall Institute today. Nice little book. I have never read anything by Ann Rinaldi before. I am very curious. Lovely story about a young girl (Rebecca) in nineteenth century Ohio. She has a tough life helping her mom take care of her dad, seven brothers and a sister and teaching herself to read, write and do sums. She is afraid of Indians, but then she meets Tecumseh, a powerful Shawnee leader. She strikes up a friendship with him and as she grows older this friendship deepens into love. This is not your average boy meets girl story. The author has obviously done a lot of research and the story is very rich in detail. Besides, Rebecca is a strong-minded character which makes it very interesting to read about her life and the choices she makes. I will put this book into Marlene's English Books BookBox. All the other journals sound very interesting. Looking forward reading this book. Thanks for the speed reading, Suzy26! A sleepless night brought me to this book. Interesting enough. I don't understand Rebecca's choice in the end, however. Seemed like only the greasy hear did stop her. I will be in Venice for a couple of days. I'm sure I will find a good place to leave this book.